This LiPo battery charge bag is a must have for any Lipo charging station, the LiPo battery charge bag is made from a very strong fire resistance material, if you are charging or discharging your lipo battery and it fails this LiPo battery charge bag will help contain a fire. 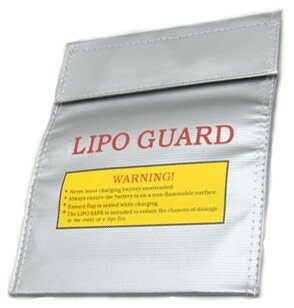 You can also use the LiPo bag for transportation of your Lipo's to the flight field. The LiPo charge bag is 220 x 180 mm and will house small LiPo batteries like the DJI Phantom 3s 2200 mAh LiPo. Hard to asses te effectiveness of this unless it is used, but given the potential risks with LiPo batteries, this seems a low cost sensible precaution. There are some youtube videos that demonstrate its effectiveness. Better safe(r) than sorry.